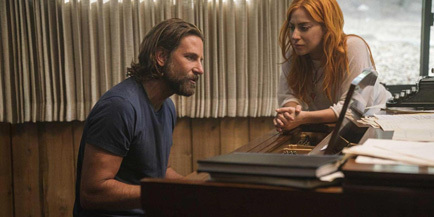 Bolstered by two powerful performances from its leads, A Star is Born, directed by Bradley Cooper, may not reach the heights it was clearly aiming for but it is still well done, often entertaining and sometimes genuinely moving. The movie’s story is very familiar by now. Bradley Cooper plays Jackson Maine, a fading rock star who falls in love with a young singer and makes her his protégé only to see her star eclipse his. It’s not necessarily a new or even specifically interesting premise but as always, it’s the execution that matters and even though the movie doesn’t exactly nail it out of the park, it’s still a wonderfully moving rendition of a well-known story. The movie begins as Jackson is finishing up a show and heading out for the night. It wastes no time establishing where he is in his life and career. And it does so in an effective, yet economical way. He drinks in the back seat of his car as he is being driven around. When his liquor runs out, he becomes desperate to find an open bar but because, neither he, or the driver know the area, they have a hard time finding one. Because of this, they settle for the first place that looks like somewhere he can get a drink and just like that he and Ally’s (Lady Gaga) fateful meeting is set in motion. This place turns out to be a drag bar where Ally is about to perform. As he watches her show, Jackson instantly falls for her. Afterwards, her friend introduces them backstage and they immediately hit it off. It’s a quietly powerful and intimate scene. The understandable nervousness and hesitation takes a back seat to their magnetic attraction. Although initially hesitant, Ally eventually goes along when Jackson asks her to get a drink with him. It’s kind of odd that the reason he wound up at the drag bar was that he had nowhere else to go for a drink but after the show, he suddenly knows a bar that seems to be open all night. But that’s just one of those things you, sometimes, have to overlook in movies. Ally’s guard still seems to be up, but it’s evident that she is at least opening up to the idea of getting to know him. And it is here where they start to really see and understand each other for the first time. While at the bar, a drunk man starts to harass Jackson and Ally gets visibly upset at the fact that this man treats Jackson like he’s not even a real person. She punches the man and they end up leaving. This foreshadows the protective role she takes in his life. They, then, head to a supermarket to pick up some frozen peas to put on Ally’s hand. Afterwards, they wind up hanging out in the parking lot where they continue talking and getting to know each other. And as Ally sings to Jackson he can’t help but fall for her. It’s a powerfully moving moment that portrays two wounded people finding each other. But it’s also a testament to the power of film. It’s such a genuine moment that you forget you’re watching a movie. And you feel like you’re peeking into the lives of two real people finding each other in the whirlwind that is life. It’s as powerful as it is beautiful. The movie does a great job at capturing the tentative push and pull dance of an emerging love. It portrays how people cautiously open up to one another and the leap they take together. There is a sweetness and tenderness to it. They both portray the vulnerability that comes from taking a chance to open up your life to someone else. But it’s not all perfect for them. Jackson’s growing drug problem, dwindling relevance and ego make him jealous of Ally’s rise. This manifests in him treating her badly and taking out his frustrations on her. There is one scene that is particularly tough to watch. And the scene is made all the more heart wrenching because of the way it is in such stark contrast to their earlier, happier scenes. And the way the movie portrays Jackson’s rock star life is also interesting. Its choice to overlook or ignore the debauchery of his lifestyle is one of the movie’s boldest choices. These rock star party scenes, when done well, can be so entertaining that it’s almost the equivalent of playing the hits for fans. In fact, after their first performance together, it seems like the movie will give into this crowd-pleasing impulse. But instead it treats the after party like it’s an afterthought. It pushes the moment aside and cuts to the aftermath. That’s because cooper understands that the movie truly shines in the quiet, small moments between Jackson and Ally. It also captures the mood of a movie that resembles more a comedown than a lively party. For a good stretch, it seems like A Star is Born will live up to its ridiculous hype. Unfortunately, the movie seems to lose its way at the point when Ally’s career starts to take off. Not only does it introduce a borderline cartoonish, thinly developed, antagonist in the form of a sleazy record producer who wants to make Ally “a star.” But the movie also starts to resemble a sped up, not particularly interesting episode of Behind the music. The rise and eventual fall happen simultaneously via Ally and Jackson’s stories, respectively. Although her ascension’s time line is a little unclear it still feels incredibly fast because the movie goes through so many things so quickly. This not only feels unrealistic but because so much ground is rapidly covered, it makes it hard to get emotionally invested or for all of it to even fully register. And the biggest problem is that it keeps its stars apart for stretches of the movie. It’s almost as if the movie is actually self-sabotaging. There are still genuinely powerful moments like the hard to watch, unsettling, Grammy scene but a lot of the momentum is lost and it feels like it’s meandering. And the sleazy record producer’s influence on the conclusion seems contrived. Bradley Cooper is great in the lead role and seems to channel Eddie Vedder. It is a powerfully moving performance and is restrained when it could have easily been over the top and flashy. He gives the character plenty of heart and depth. He conveys a faded rock star weariness that feels genuine. But more importantly he never feels one-dimensional. He doesn’t just seem like a cool rock star stud. Although he is charming and charismatic enough that you can easily buy him becoming a huge star. Cooper’s powerful performance also shows that Jackson is a man that has been chewed up and spit out by the rock star machine. He was so focused on achieving his dreams that he never stopped to think about or perhaps even realized all that he would have to give up. It’s been so long since anyone had treated him like a real person that he’s almost forgotten what it was like to be one. So, when Ally asks him a simple question about himself, his reaction and eagerness to change the subject tell her—and us—that it’s been a long time since anyone talked to him like an actual person or asked about him. Although it would be unfair to expect him to be able to sing like Lady Gaga he does get overshadowed and his songs do sound a bit generic, at times. It might be tempting to call this Lady Gaga’s “star is born” moment. But the truth is she has been a star for close to a decade now. It does however, mark a new phase of her career as she is absolutely captivating and completely owns the screen. And the movie, wisely, realizes that her powerful voice is one of its best weapons and doesn’t hesitate to use it. Her singing elevates scenes that would have been good to a whole new level by adding a level of emotion that few movies ever reach. More importantly, her performance has emotional depth, vulnerability and she have genuine acting chops. She inhabits the character so well that we can look at her and not be distracted by the fact that she’s a mega star. She also does a great job of portraying the doubt of someone who has met a lot of rejection. Although she is undeniably beautiful, her nose doesn’t fit within the arbitrarily limited definition that has been defined as “conventional” beauty. Because of this, Ally has had the idea that she’ll never be “beautiful enough” to be a star drilled into her head, so much so, that she has basically given up the idea of making it. Of course, this makes Lady Gaga’s real life success all the more impressive. The supporting cast isn’t really given much to do or much of a chance to leave a lasting impression. Because of this, they are mostly relegated to the background. Jackson’s brother and Ally’s father come the closest to making an impression. Jackson’s brother is vaguely drawn but they have a strong chemistry. Together they hint at Jackson’s past and their complicated, yet moving history. The movie also doesn’t delve too deeply into Jackson’s relationship with his father but it gives enough details for the audience to fill in the rest. It’s to the movie’s credit that it trusts audiences enough not to spell it out in great detail. After all, father issues are universal enough for audiences to relate to and understand the weight that relationships with our parents put on our shoulders and how it impacts the choices we make and lives we lead. Andrew Dice Clay does a serviceable job as Ally’s father and he and Lady Gaga have good chemistry. He portrays her father in a credibly and affecting way. His group of friends are vaguely drawn and seem to be there mostly to be a sounding board for her father and provide some laughs. While Bradley Cooper does a great job, especially for a first-time director, his directorial style doesn’t leave much of an impression. It’s certainly true that not every director needs to have a lot of flair, but his style is so subtle that it borders on non-existent. And the pacing of the movie is a bit odd. There are stretches where it feels like the movie is just meandering along, unsure of where it’s going. Of course, it doesn’t help that the first act is so powerful that no matter what, the rest of the movie would have had a hard time living up to it. While it doesn’t necessarily live up to the hype, the movie is a great showcase for the stars and it provides enough entertainment and emotion to overlook its flaws.